Is Oxycodone Addictive? How Addictive is Oxycodone? Oxycodone is a narcotic opiate pain medication that is known to be highly addictive. It is available by prescription in various formulations, and is marketed under trade names such as OxyContin and Percocet. Yes, oxycodone is addictive. Oxycodone acts on receptors in the brain that create a euphoric feeling in the user. The user can experience mild to severe withdrawal symptoms when use is discontinued, making it uncomfortable for users to stop taking it. Any person, even those without a prior history of addiction, can become physically dependent on oxycodone after using it for more than 30 days. In fact, according to the American Academy of Neurology, 50 percent of people who take a medication like oxycodone for 90 days are found to be still using it or another pain medication five years later. Signs of addiction can vary and fall into several categories that include physical signs, symptoms of withdrawal, and changes in the user's social life or habits. Signs of Abuse. Physical symptoms of oxycodone use will depend on the dosage and the user. However, some telltale signs of use include appearing drowsy, relaxed and calm with markedly constricted or pinpoint pupils. With prolonged use, addicts may lose weight or appear with dark circles under their eyes. Signs of Withdrawal. Signs of addiction to oxycodone may also be notable with the presence of withdrawal symptoms if the addict is unable to continue using oxycodone. Some signs and symptoms of oxycodone withdrawal include chills, sweats, itching, pallor (pale skin), restlessness, irritability and anxiety. Behavioral Signs. Behavioral changes in the user such as isolating themselves, borrowing money, lying, stealing and cheating may also indicate an addiction to prescription medication. Friends and family members may also be on the lookout for the user running out of their prescription of oxycodone earlier than indicated, as a sign that it is being taken in excess. Find Recovery Now Don't wait to get your life back. Find the perfect treatment option for you. You are prescribed oxycodone but take more than prescribed. Take it for periods longer than intended. If you find yourself craving oxycodone or becoming irritable or restless waiting for your next dose, you may be addicted to it. If you have a history of addiction to other drugs, you may be at increased risk of becoming addicted to oxycodone. Ask if the user has tried to quit using but has not been able to. Inquire if withdrawal symptoms are preventing the user from quitting altogether. Explain that treatment options exist that make the withdrawal process as comfortable as possible, as this may make treatment more appealing. Going to treatment is ultimately in the hands of the individual, but being firm in the request, giving an ultimatum or staging an intervention might encourage your loved one to get help. 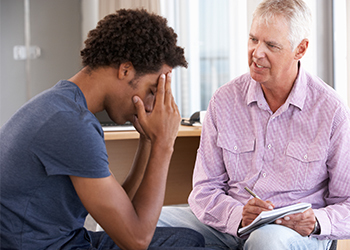 An intervention is a process in which people meet to encourage a loved one to seek help for their addiction and can be most effective in breaking through the denial that addiction creates. Close friends and family members should be invited to participate in the intervention. Aside from the addicted loved one, other using friends or family members who may negatively impact the outcome should not be invited to participate. Friends and family members can 1) share how the addict's drug use has negatively impacted them and 2) offer help and share what they will do if the addict refuses to get help. According to mayoclinic.org, if a plan for treatment is offered, it should include clear steps, goals, and guidelines. Some families may opt for the assistance of a professional interventionist, to facilitate the process. Going to treatment is ultimately in the hands of the individual, but being firm in the request, giving an ultimatum or staging an intervention might encourage your loved one to get help. However, this whole process can be incredibly taxing. If you are feeling the brunt of a loved one's addiction and want to find oxycodone treatment options or seek guidance about intervention, please call us at 1-888-993-3112Who Answers?. Someone addicted to oxycodone may seek recovery in a 12-step support group such as Narcotics Anonymous or Pills Anonymous. Because addiction doesn't just impact the addict, it will be important for friends and family members to seek support for themselves. The 12-step support group Nar-Anon is a recovery program for friends and family members of addicts. This support group allows the addict's friends and family members to work the 12 steps and seek to improve their lives whether or not the addict is still using. For this reason, Nar-Anon can be especially beneficial if the addict were to experience a relapse. If friends and family members are not healthy in their programs of recovery, the addict's relapse may be prolonged. Parents of Addicted Loved-ones (PAL) is a non 12-step group that provides education and support to parents. Treatment for addiction to oxycodone can be provided on an inpatient or outpatient basis. If a user was prescribed oxycodone to treat a medical condition, it is important that the prescribing physician is aware of the user's dependence on it. Withdrawal symptoms make it difficult for many oxycodone addicts to get and stay sober at the outpatient level of care, which makes inpatient or residential treatment more appealing and effective. Medication-assisted treatment programs use methadone or buprenorphine for oxycodone addiction withdrawal. These medications can be administered on an outpatient basis, and are typically done so in combination with regularly scheduled outpatient therapy and addiction recovery counseling. Partial hospitalization or day treatment - in which the individual in recovery has access to some hospital services, but is not admitted as an inpatient. Methadone and buprenorphine are also used as maintenance medications to help curb cravings and manage chronic pain, but non-pharmaceutical approaches such as mindfulness-oriented recovery enhancement (MORE) have been shown to be effective alternatives. Disengage from unhealthy thoughts and behaviors. Develop helpful beliefs and actions. Utilize positive motivational energy to find pleasure in rewarding events and experiences. A 2014 article published in the Journal of Pain Symptom Management observed that participants enrolled in MORE treatment showed a significant reduction in the interference of pain in daily functioning and life enjoyment. Those with health insurance coverage might call their insurance company or visit on the provider website to search for substance abuse treatment options. You want to find a program that shows treatment for painkillers or opiates, since that encompasses oxycodone addiction. Trying to find the right treatment program for addiction to oxycodone can be overwhelming, but you don't have to make these decisions alone; our treatment support advisors are standing by 24/7 to help guide you through this process. Please call us today at 1-888-993-3112Who Answers?.